At the end of February, Nick Redfern wrote a blog post about The Lurker at the Threshold – a novel that is purportedly by “H.P. Lovecraft and August Derleth”, although it’s generally considered to be almost pure Derleth, worked up from just a brief fragment by Lovecraft that was discovered after his death. Like Agatha Christie’s N or M, which I mentioned a couple of weeks ago, The Lurker at the Threshold is a book I’d had sitting unread on the shelf for years. I was finally prompted to read it by Nick’s very positive words about it... and particularly because he mentioned that it “cites the work and books of Charles Fort”. I happen to have a special fascination with that small and exclusive sub-genre of fiction which mentions Charles Fort by name... if for no other reason than that the first few times I ever came across Fort’s name was in works of fiction. I can’t be absolutely sure, but I think the very first time was in a short story by R.A. Lafferty called “Nor Limestone Islands”, which was part of an anthology entitled Universe 1 that was published in 1971, although I read it in 1977 (I know, because I used to write down the title of every book I read and the year I read it... in fact, I still do). Often when a fiction writer namedrops Fort it’s just to say “look, weird things really do happen” – but Lafferty’s “Nor Limestone Islands” is a genuinely Fortean tale. The limestone islands in question are islands in the sky, from which mysterious things sometimes fall to earth. And you can’t get more Fortean than that. As a general rule, the notion of “citing a reference” is much commoner in non-fiction than in fiction. One prominent exception to this rule is H.P. Lovecraft, whose fiction is often packed with citations. Sometimes the works cited are themselves fictitious, such as the Pnakotic Manuscripts or the infamous Necronomicon, but often they are real works – the books of Charles Fort among them. So it’s no surprise that August Derleth—who was a master of imitation—copied this aspect of Lovecraft’s fiction in The Lurker at the Threshold and some of his other Lovecraftian pastiches. But H.P. 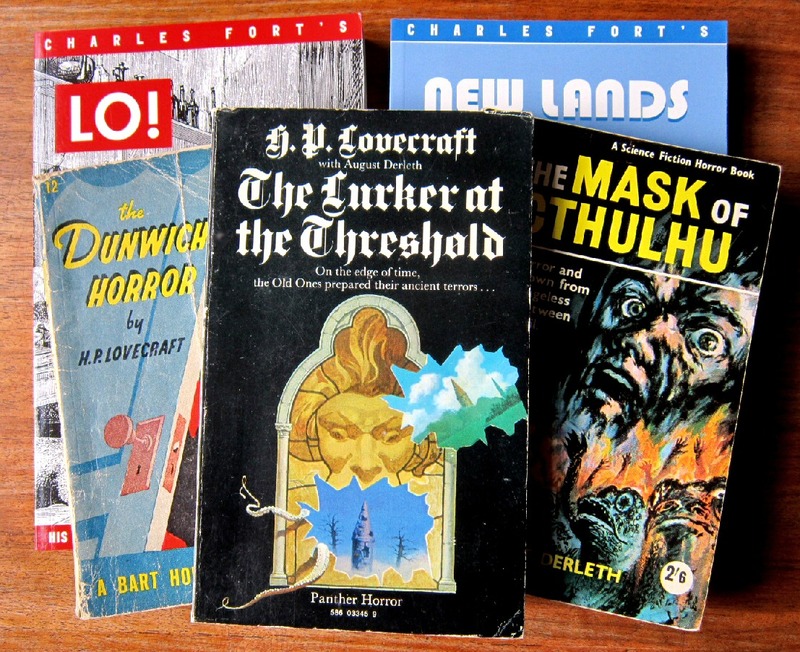 Lovecraft wasn’t the only writer that Derleth strove to imitate – he also wrote numerous Sherlock Holmes pastiches featuring his own Holmesian detective, Solar Pons... and Charles Fort is mentioned in at least one of these stories too! You want to read "Chasing Vermeer," by Blue Balliett. Well, I guess I do trust you, so I'll add it to my list... although as you've probably noticed, I hardly ever read fiction that was written after 1980. However, I can probably manage a Young Adult book from 2004, which is what I see from Wikipedia this one is. Which reminds me... I really need to read one of your books one of these days. Feel free to recommend one of those as well, if you like! Well, it's not gonzo Fortean, but what I wanted to do in The Ghost Sitter was write a fictional ghost story that worked like a "real" one, picking one common theory of how ghosts work (that they're "people who don't know they're dead") and work out what exactly that would mean for the ghost. So it might be the one you find easiest to get into. Thanks, Peni - I've added that to my list too! 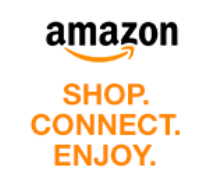 I can HIGHLY recommend the collection "To Charles Fort with Love" by Caitlin R. Kiernan! She also references Fort in later works. And she is awesome. thanks! Sounds like another book I should add to my "must read" list. Thanks very much for the suggestion! R. A. Lafferty's "Nor Limestone Islands" also appears in his 1974 collection, DOES ANYONE ELSE HAVE SOMETHING FURTHER TO ADD? : STORIES ABOUT SECRET PLACES AND MEAN MEN. Another story in that collection, "Boomer Flats," mentions Ivan Sanderson, the famed Fortean and cryptozoologist. Thanks for the info. According to my records (!) I did read "Does Anyone Else..." in 1981, but it was a library book and I don't have my own copy. The Ivan Sanderson reference would have gone over my head at the time. I'll have to look out for another copy of the book so I can re-read it! Lafferty's "Boomer Flats" can also be read in an anthology edited by Kim Stanley Robinson, FUTURE PRIMITIVE: THE NEW ECOTOPIAS (Tor, 1994). The reference to Ivan Sanderson is in the first sentence of the story: "'In the tracks of our spiritual father Ivan Sanderson we may now have trailed a clutch of ABSMs to their lair,' the eminent scientist Arpad Arkabaranan was saying in his rattling voice." An "ABSM" is an Abominable Snowman. Thanks - sounds great. I used to like Lafferty a lot when I started reading SF in the 1970s. He was one of the high profile authors in those days (when the focus was on short fiction anthologies rather than novels) but he's rather fallen into obscurity since then. It's tragic that Lafferty has fallen into obscurity, since he was such a gifted, brilliantly imaginative author. He was an "American original" if there ever was one. Yes, the focus is more and more on novels in the SF world. Unfortunately, SF novels these days are too often bloated and over-padded. When I started reading SF in the 1970s, SF novels were much leaner and (generally) much better than they are today. Lafferty wrote a number of SF (and non-SF) novels, all of which are quite worth reading, but I always preferred his short stories. Daniel Petersen has an excellent R. A. Lafferty blog, "The Ants of God Are Queer Fish" (antsofgodarequeerfish.blogspot.com). Thanks for the link to the Lafferty blog -- and looking at it just now I see that there is another one called "Continued on Next Rock". Definitely ones to start following! Fairly randomly running into this. I'm the bloke behind the Ants of God blog. Just a quick note to say that Fort comes up by name frequently in Laff. I don't have the references to hand, but I don't think it would be an exaggeration to say I've seen him name-dropped at least a dozen times in Laff's fiction. One Lafferty novel I can think of that mentions Fort by name (and Fortean skies) is Not To Mention Camels (1976). Thanks very much, Daniel - especially for the link, which is an amazing find. 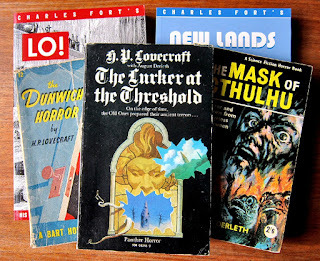 Here in the UK it's almost impossible now to get hold of any of Lafferty's collections, so apart from a couple that I read as library books long ago, I only have access to a dozen or so stories in magazines and anthologies. So I will do a lot more than search the ebook for references to Charles Fort - I'll eagerly read the whole thing!